Another day, another hooklink. This new braid by Gardner, Ultra Skin, is not too supple or hard. Perhaps the perfect balance? 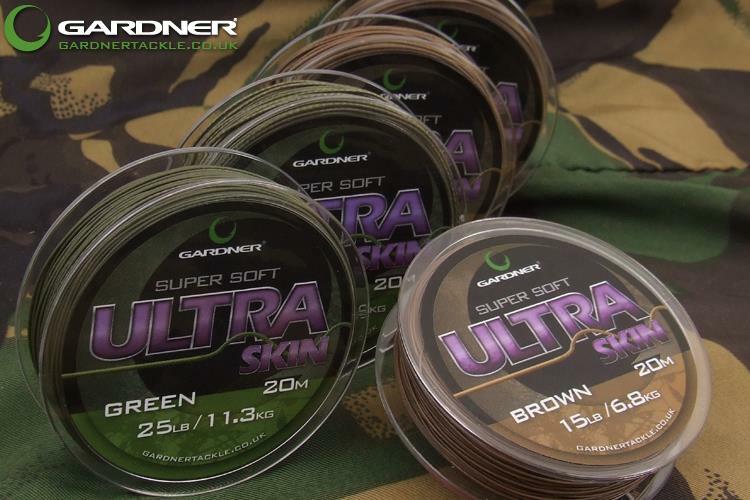 The new Gardner Ultra Skin is a super soft, supple and ‘skinned’ braided hooklink material. Ultra Skin is initially available in just two matt colours – green and brown and in three breaking strains – 15lb, 25lb and 35lb. These are perfectly suited a wide range of carp and specialist angling situations. The 15lb strain has a very low diameter (only 0.50mm) and has been used with huge success by both carp and specimen anglers looking for a hooklink that offers finesse without compromising reliability. The 25lb version is the all rounder for the carp specialist. It retains a low profile whilst the extra strength doesn’t mean a significant jump up in finished diameter, and at 0.55mm it is still amazingly thin for a 25lb skinned hooklink! In 35lb Ultra Skin is simply formidable! It is capable of coping with the most arduous big carp fishing situations, despite only being a fraction thicker than the 25lb versions. If you’re fishing for big carp on a big water, near snags or pads, you’ll need a hooklink to rely on and this is it.